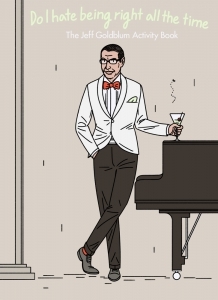 We pay an illustrated homage to Jeff with all your Wes Anderson hues, mucky Dinosaur dungs and alien invasions. Lots of mazes, games and puzzles all drawn out by different illustrators. Follow his films, his move life with our activity book. First crush, only love, most charming man on screen. To say Jeff Goldblum is the one great thing in this world would be a mass under statement. He's someone who gets more suave with age and we hope for many years yet.